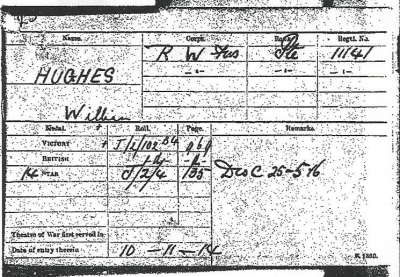 William Hughes was born circa 1895 in Cross Row, Pentre, Flint, Flintshire, he was Baptised on the 6th May 1897 in Flint Parish Church. John & Mary were living at Cross Row from possibly before 1891, although we know they were living at Ames Yard in 1886 when Sarah was born. The family moved to Farnworth between the 1891 census and the 1901 where we find William, living at 147, Hall Lane, Farnworth. Head of the household is John Hughes, 39, a Chemical Labourer and his wife Mary, 41, who both had been born in Flint, Flintshire. Their eldest son John, 18, single and a Collier (Hewer) had been born in St. Helens, Lancashire. Their eldest daughter, 15, single, was a Cotton Weaver. The rest of the family, bar Fred had been born in Flint. They were daughter, Annie, 12, sons Edward, 9, Ben, 7, William, 4 and Fred 1 who had been born in Farnworth. However William must have returned to Deeside at some time after the census and or discharge on the 9th October 1917, as he met my Aunt Lilian Margaret Hallows, for his father wrote to the Army asking for information about his son and gave my Grandmother’s address of 36, Queens Street, Queensferry as the C/O address for a reply. William’s Flintshire WW1 Index Cards, F9 (Queensferry), gives his Regimental information and tells us that he was living at, 36, Queens Street, Queensferry. He was awarded the Mons Medal in retreat of Mons & Shrapnel wounds 17 times on body? Lost right eye in Festiburt 1915. Died 19th November 1919. Card signed by William HUGHES 17th January 1920*. On the reverse of Card (Left hand corner cut off, therefore words missing.) “….y discharged in 1916 was recalled………… went out to Salonika and got Malaria Fever, being discharged, no longer fit for Service. (9th October 1917. )” “See letter dated 28th February 1920 from G.H. CHARLES, Esq.”. *signed after his death, so must have been P.P. signature. Will double check. I do not know who C.H. Charles was, but he also signed at least one other card to my knowledge, so he may have been alongside J.P. Walters, one of the people who gave out the Flintshire WW1 Index Cards and had to collect them from the relatives or servicemen in 1919/20. William’s Medal Card from the National Archives. It seems he was discharged on the 25th May 1916, but it gives no reason, however his Flintshire WW1 Index card gives a picture of how William had suffered throughout the war, being discharged after being wounded horribly and then recalled only to suffer Malaria. William then married my Aunt Lilian after his Army Service, when he was discharged, but for some reason, beyond my knowledge he went away to live. St. Deniol’s Church, Hawarden – Page 32 No 63 2nd Feb 1918 William HUGHES age 23 Bachelor Ironworker, 36 Queen Street, Queensferry. Father John HUGHES Steel Smelter & Lilian Margaret DAVIES 20 Spinster 36 Queen Street, Queensferry.Father Alfred DAVIES Steel Smelter.Witnesses, John BARKER Gordon WILLIAMS. He was going to collect his pension from the Post Office with one of his brothers and whilst he was returning from Kearsley, he saw a lorry going his way, and as William knew the driver he asked for a lift, jumped on the trailer at the back of the lorry and somehow went under the wheels of the vehicle. However, I could not find his burial. . He died on the 19th November 1919, ironically, after suffering so much during his time in the war, he should die like this, and so although he theoretically did not die in the war, he should be remembered, or so someone thought when they filled in his Flintshire WW1 Index Card. Death:- 19th November 1919 – Place:- Bolton Road, Kearsley, Lancs. His address on the Death Certificate (HD096728 No. 283) was Railway View, Farnworth. Certificate received from S.F. BUTCHER, Coroner for Lancashire. Inquest held 20th November 1919, Death registered 21st November 1919.